There are three sites covered for recording and conservation, these are: Raw Nook (Railway Terrace) Nature Reserve, Toad Holes Beck and Caldene Fields. The 3 adjacent sites are situated off the A638 at Low Moor Bradford, West Yorkshire. Map Ref: SE168 290. 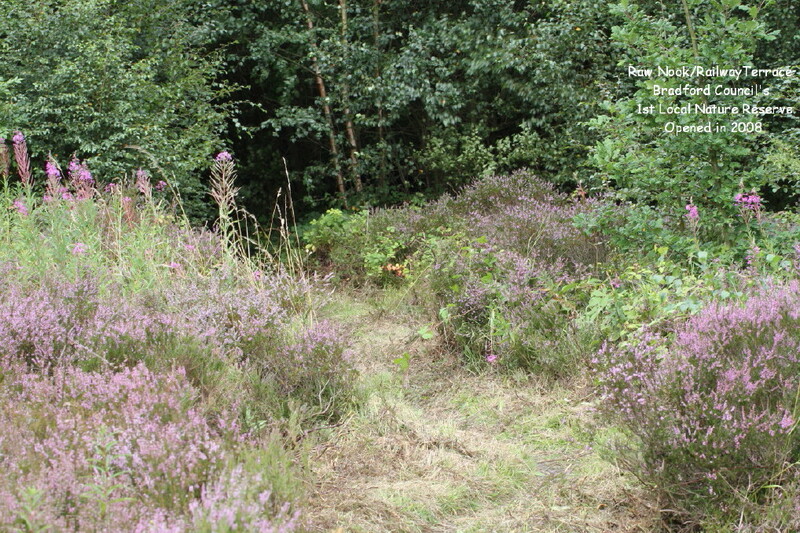 This regenerated site is formerly the old Low Moor train station and consists mainly of a Lowland heath habitat with a mixed of Silver Birch, Rowan, Goat Willow and Oak trees. There is a wildflower meadow to the south of the site. This site consists of 3 ponds (the large pond nearest the motorway has no public access) a wildlife meadow area, Hawthorn scrub and some mature trees like Poplars Sp, Willow Sp and Ash. This site can be located from Furnace Road which is off Cleckheaton Road A638 or simply walk through Raw Nook nature reserve till you come to a bridge, cross this bridge and the entrance to the site is facing you. A walk through the Raw Nook Nature Reserve brings you to Caldene Fields on your left where there is no public access. However, the fields can be viewed from a footpath that runs adjacent to Raw Nook NR. Carry on walking through the reserve with Caldene Fields again on your left you will reach a railway bridge. Cross the road and follow the footpath with the factory on your right and you will enter Toad Holes Beck.